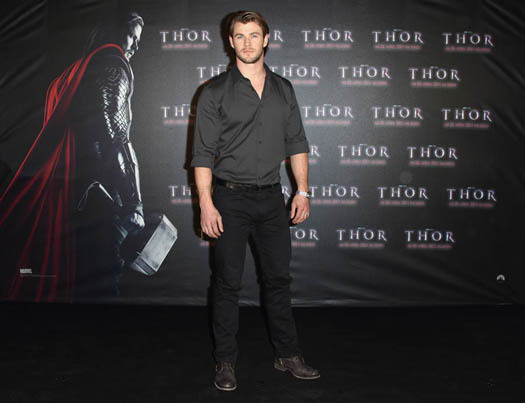 MUNICH, Apr 13, 2011/ — With co-star Natalie Portman well on her way in her pregnancy, promoting the film fell into the hands of actor Chris Hemsworth who plays the title role in Thor. Making an appearance at the Hotel Bayerischer Hof on April 13 in Munich, Germany for a photo call, the 27-year old Australian actor is being held as this summer’s new hottie! Best known in his native Australia for playing Kim Hyde in the Australian soap opera “Home and Away”, Chris Hemsworth entered the consciousness of sci-fi/fantasy fans when he played George Kirk, the father of James T. Kirk in the reboot of “Star Trek” two years ago. “Thor” is slated to hit theaters on Apr 21st in Australia and May 6th in the U.S.